It's finally gotten cold outside (winter seems to come to Texas later every year), so my thoughts have turned to soup. These warm, easy to eat concoctions are the very definition of comfort food. But what can you do to turn a basic recipe into a showstopper? Or maybe you just want to make canned soup more palatable. Here are twenty ways to soup up your soup. 1. Add parsley. If your soup tastes flat or seems to be lacking something, parsley is probably it. If it still seems to need something, it may be salt. 2. Add lime. A little lime juice and cilantro can give a brothy soup a Mexican flair. Or if you add lemon, you can get more of a Greek feel. Strands of citrus zest can also make a beautiful soup garnish. 3. Add sautéed garlic. Slice the garlic as thin as you can and sauté it until it is good and crispy. You only need a pinch sprinkled over the middle of the bowl. 4. Add a dollop of dairy. Greek yogurt, creme fraiche or sour cream not only looks pretty on top of a soup that has some body to it, but it will give it a richer, fuller flavor. 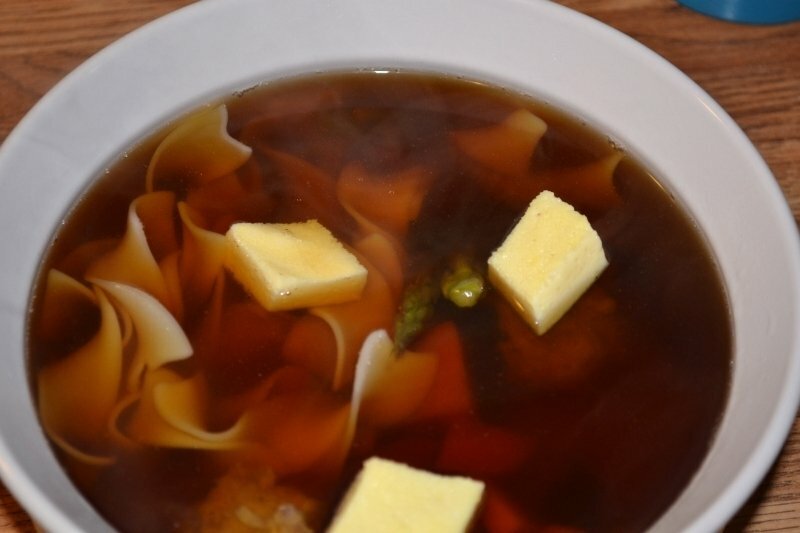 These kind of dairy products enhance any number of soups, from tomato to black bean. 5. Put a pastry lid on it. Use puff pastry (you can find squares of puff pastry that fit easily over a six (measure) inch ramekin) to add a golden flaky top to a thick or chunky soup. 6. Give it some veggies. Use a mandolin to cup paper-thin slices of cucumber (or tomato) that you then sprinkle with herbs and float on the soup bowls. Or, shave curls off carrots or zucchini and make a little pile on top of the center of the soup. 7. Spice it up. Just a half teaspoon of cayenne pepper or a few shakes of Tobasco sauce can completely change the character of a soup. If you're not used to spicy soup, add a little and taste, then add a little more until it achieves a level of spice you are comfortable with. 8. Float a couple of croutons on top. It is so easy to make your own. 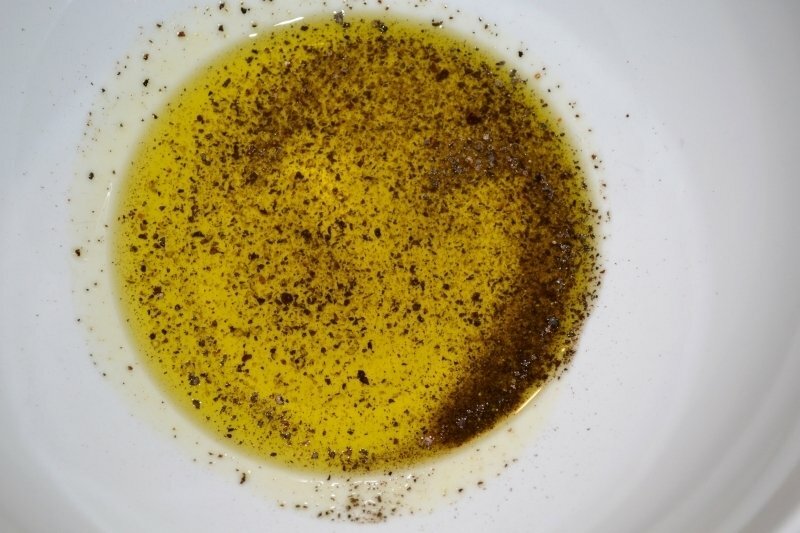 Just grind some fresh pepper into a puddle of olive oil at the bottom of a large bowl. 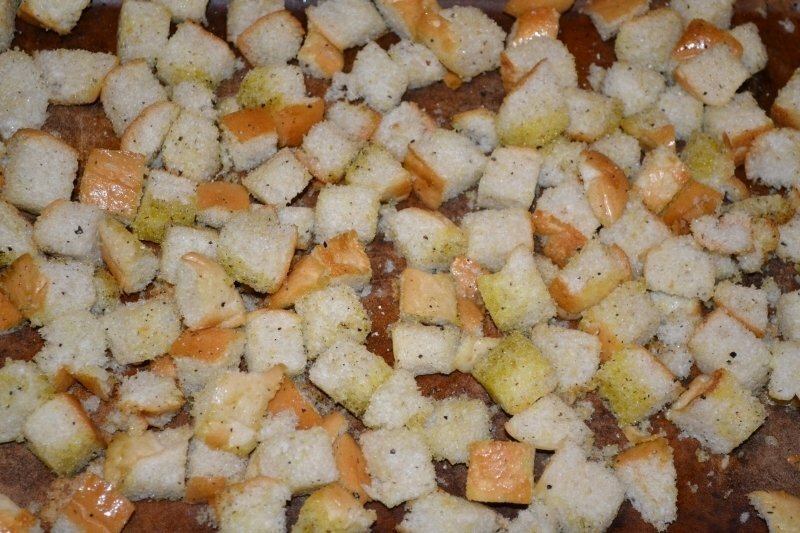 Cut cubes of bread, toss the cubes in the herb mixture, then spread on a baking sheet. Bake at 400 degrees until they dry out. 9. Create 3D art. For instance, balance a single sprig of an herb crossed with a piece of citrus zest on top of each serving. 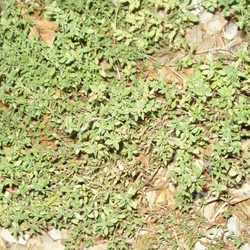 Pick an herb that was used in the soup recipe. If you don't know what exactly went into your soup, crush a piece of the herb you would like to use between your fingers. 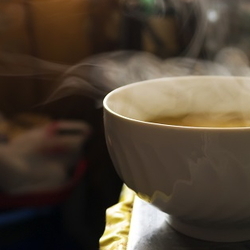 Hold your hand over the soup pot and smell the combined fragrance. If it smells pleasing, it is probably a good match. 10. Add edible flowers. Use sweet flowers (pansies, rose petals) with sweet fruit soups. Go for spicier options (like dianthus or calendula) to savory ones. 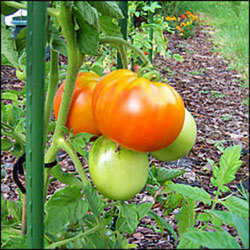 Whatever flowers you choose, make sure you have identified them properly, as many flowers have poisonous look-alikes. Also, do not eat flowers from the florist trade, as they have probably been sprayed with high levels of pesticides. 11. Pep it up. Sometimes a simple grinding of black pepper can be all the contrast a light colored soup needs. 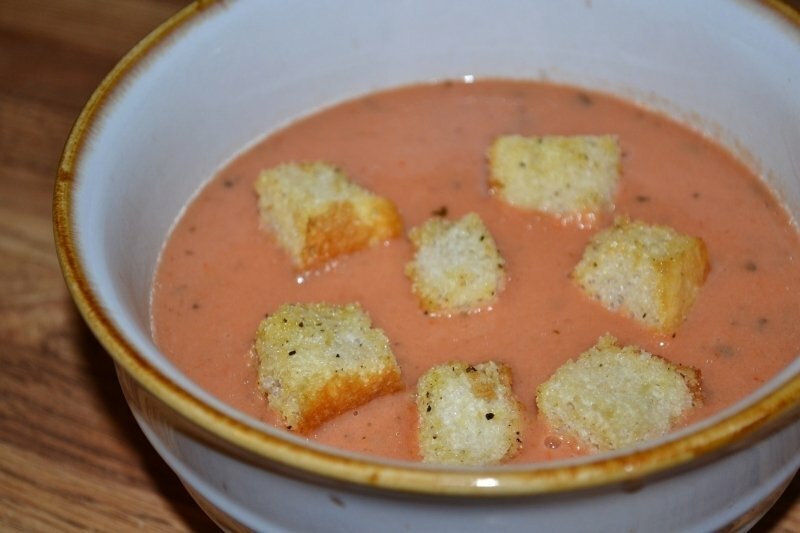 Light creamy soups also look elegant with a dusting of paprika or other colorful spices. 12. Make it grate. 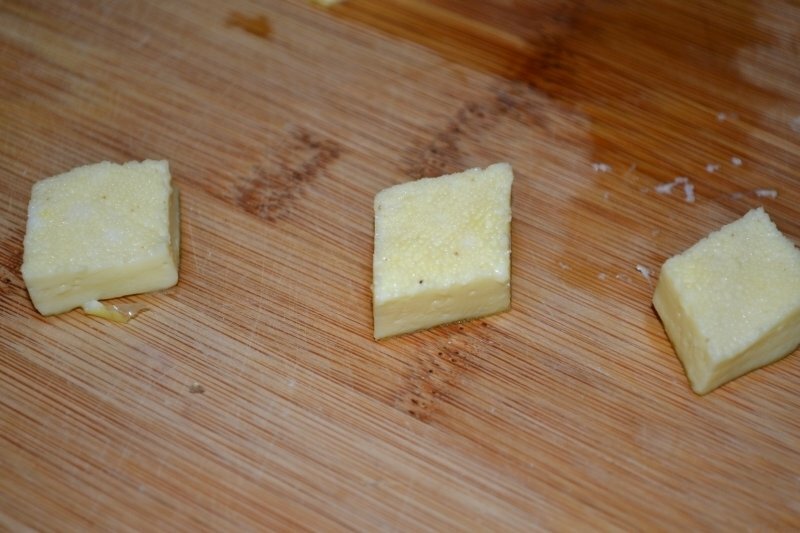 Grate some parmesan cheese onto the surface of the soup. Or sprinkle on a little shredded cheddar. Whatever your favorite cheese, there's probably a soup that would pair beautifully with it, so don't be afraid to experiment. If you're not sure, before you offer your flavor combination to guest, put a little soup in a ramekin and add a tiny serving of the cheese to preview the effect. 13. Make it fit for royalty. Custard cutouts (better known as royales) are traditionally floated on consommés and elegant cream soups like asparagus. To make then, you combine an egg with a tablespoon or two of milk, and flavor it with salt, pepper and nutmeg . Pour it into a greased loaf pan and bake in a hot water bath in a 300 degree oven for 25 minutes, or uintl well set. Cut the custard into decorative shapes with small cookie cutters. 14. Add a ring. Float a single onion ring on the surface of a thick soup (such as potato). Alternately, sprinkle on a handful of canned fried onions. 15. Make it seedy. Roasted sesame seeds or pepitas (pumpkin seeds) add a nice nuttiness to boldly flavored soups. Actual nuts, such as almonds, which have been sliced, minced or slivered, can also look nice floating in soup. You can add nut butters to soup made from butternut squash. 16. Give it some crunch. Sprinkle on chow mein noodles or tortilla strips. You can make chow-mein-like noodles by frying egg noodles in peanut oil, then tossing with a mixture of sesame oil, sugar and salt. You can make tortilla strips by cutting up corn tortillas and deep frying in canola oil. 17. Make a swirl. Make a pesto sauce, or a balsamic reduction (or even just some plain olive oil), or for sweet soups, a chocolate or fruit flavored sauce. Put it in a squeeze bottle and make patterns on the surface of the soup. Keep your designs simple. 18. Got milk? 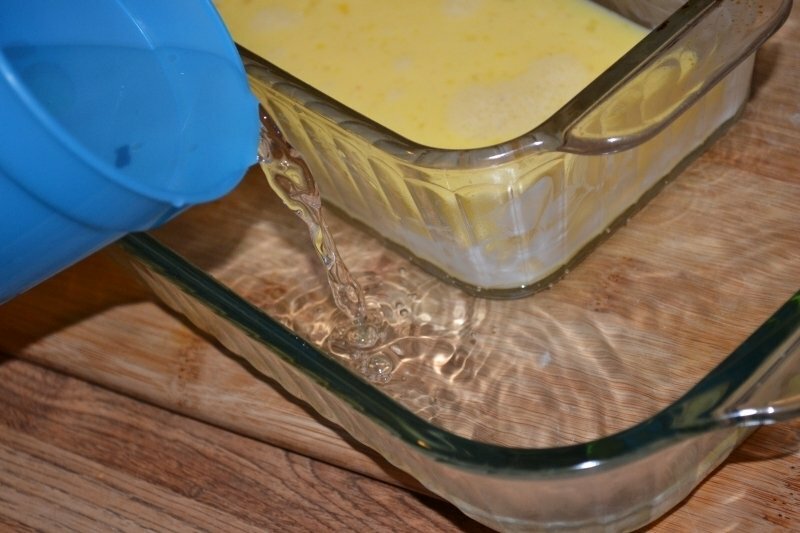 Add milk instead of water when reconstituting canned cream soups. Add stock instead of water to brothy soups. Steam some fresh vegetables and toss them into canned soup to add a burst of flavor (not to mention a few extra vitamins). 19. Add mushrooms. If you reconstitute dried mushrooms (such as shitake), stir the soaking liquid into your soup, then float a few mushrooms on top. 20. Add rice, pasta, barley or other grains. By doing this, you take your soup from appetizer to substantial main course, especially if you have cheese or meat involved. Experiment with the textures of these ingredients until you find what matches the flavors of the soup. If the soup will be stored for several days or frozen, slightly undercook pasta, as it will become softer.